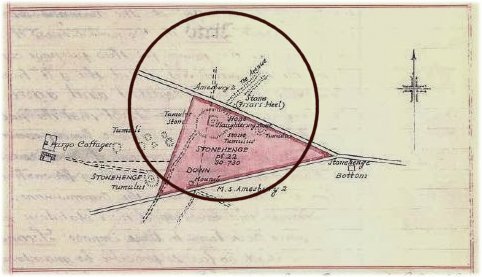 Thirdly that no building or erection other than a pay box similar to the Pay Box now standing on the premises shall be erected on any part of the premises within four hundred yards of The Milestone marked “Amesbury 2” on the northern frontage of the premises. I have wondered why, and if I have been told I can no longer remember, did he stipulate a a 400 yard radius circle rather than just say "within the premises"? A quick sketch shows his 400 yards almost covers the whole of his gifted land apart from the tips of two corners. Is that deliberate? Of course within a few years the curators houses had been built with in the 400 yards so it appears his wishes were ignored from the earliest of days. And ironically he chose the one stone in the landscape that was then moved, to the other side of the road.